Like most pregnant women, you are probably aware that heartburn is a common occurrence during pregnancy. Perhaps, you already suffer from it yourself. Sometimes, it is unclear whether that burning sensation in the center of the chest is heartburn or not. One thing is clear though. Heartburn has nothing to do with your heart! How common is heartburn in pregnancy? Studies have shown that 17% to 49% of all pregnant women will suffer heartburn. It becomes more common as the pregnancy progresses: from 22% in the first trimester to 39% in the second trimester to between 60% and 72% in the third trimester. 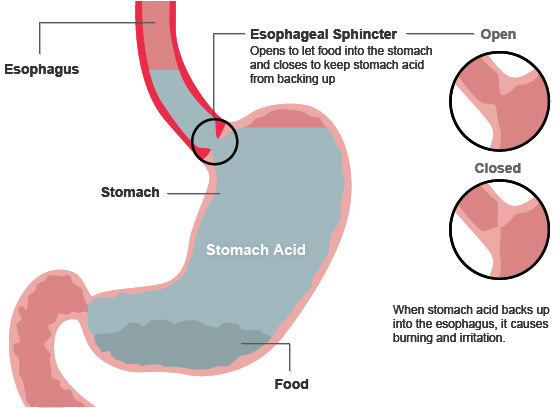 Heartburn occurs when the valve between the stomach and the esophagus is unable to prevent stomach acid from passing back into the esophagus (see the image below). During pregnancy, the hormone progesterone causes the valve to relax. This allows stomach acid to pass into the esophagus and irritate the lining. Heartburn and indigestion are more common during the third trimester because the growing uterus puts pressure on the intestines and stomach. The pressure on the stomach may also push contents back up into the esophagus. Abstain from smoking and drinking alcohol. Eat five to six smaller meals throughout the day rather than three large meals. Do not eat late at night and avoiding known triggers (e.g., spicy or greasy foods, caffeine). Watch your weight. Extra pounds can make heartburn extra worse. What can you do when you experience heartburn? What medications can I take if natural ways do not work? Over-the-counter calcium- containing antacids like Tums or Rolaids may prove helpful in relieving your heartburn. However, too much calcium can block iron absorption, so don’t take tums at the same time you take your prenatal vitamin. Always speak to your health care provider before taking these products during pregnancy. Some antacids contain high levels of sodium or sodium bicarbonate (baking soda), which can cause fluid buildup in body tissues, and other list aluminum (such as aluminum hydroxide or aluminum carbonate) as an ingredient, which can cause constipation and can even be toxic in large doses. If your heartburn is persistent, your health care provider may prescribe acid blockers such as proton-pump inhibitors (PPIs) or H2 blockers. They’re generally considered safe during pregnancy. If acid reflux occurs more than twice a week, or if you haven’t found relief after taking over-the-counter medications for more than two weeks, you may have a condition called gastroesophageal reflux disease (GERD) that requires specific lifestyle changes and medication – so be sure to talk to your health care provider for diagnosis and treatment. Does having heartburn during pregnancy mean your baby has a lot of hair? While there may be a link between the amount of heartburn you experience and the amount of hair your baby has, it’s not necessarily a cause-and-effect relationship. In other words, it’s probably not the hair on your baby’s head that’s actually causing you to feel the burn! Below, you will find a list of foods to choose and foods to avoid by category, courtesy of webmd.